Yes, you read that correctly. Just imagine that John Hughes, David Lynch, and Quentin Tarantino all made a movie baby together and Robert Rodriquez taught it how to sing. Bam! Welcome to “A GIRL”. It’s hands down in my top 5 for the year. I had missed it at both Sundance and New Directors/New Films but had been hearing the buzz.”You have to see this,” is all people were saying and not much more. I’m glad I was left in the dark because what I experienced on screen last night (opening night) was un-freaking-believable. So let’s jump into the plot: Imaginary town of Bad City, sparsely filled with the oddest of archetypes. You’ve got your James Dean wannabe, his junkie father, an arrogant pimp, a street urchin, a prostitute, and last but not least, you leading lady vampire. If you’re a good person, you get to live. Shot in black and white, the film has this beautiful other worldly quality that is difficult to explain until you actually see it for yourself. With a multiple narrative style that slowly fades away as the story progresses, it is ultimately a love story. The dialogue is almost non-existent but the music says it all. One of the most poignant scenes is between our vampire heroin/villain and Arash, (that’s our James Dean character). Long lingering shots lead to nothing but what seems like a slow motion, drug induced, chill session between the two and a record player. This is the song that plays over that scene and it is perfection. Writer/Director Ana Lily Amirpour is a damn genius. This movie is like a ballet, music video, fan letter, and memorizing nightmare all mashed up into some new genre that makes me so excited it’s difficult to articulate its greatness. The voyeuristic camera work is pure art. Playing the title role is Sheila Vand. She has this inexplicable ethereal quality that is both captivating and unsettling. You root for her. Not for a moment did I dislike her character, I kind of just wanted to be friends with her. Her loneliness is palpable and I yearn to see an entire series of these films (pretty please?). 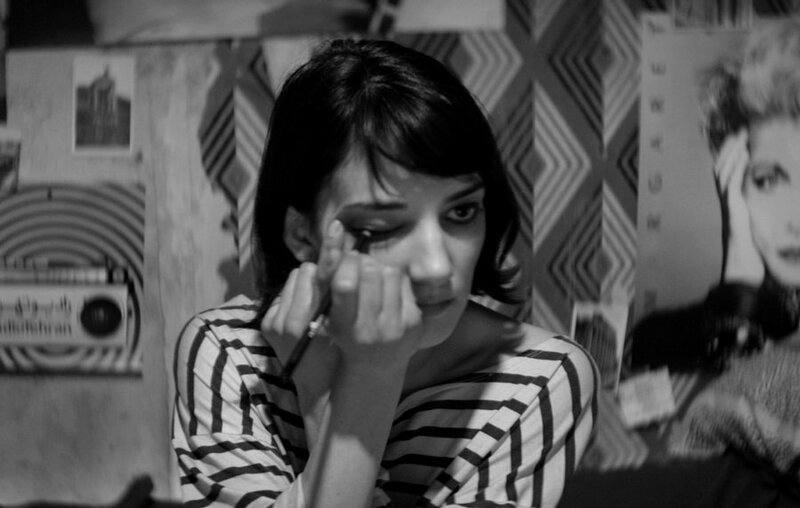 A GIRL WALKS HOME ALONE AT NIGHT is a visual mix tape of weirdness. It is elegant and bizarre and way more interesting than 95% of what’s been released this year. Go see this movie. Go now. Do not miss the opportunity to see a film you can really sink your teeth into. 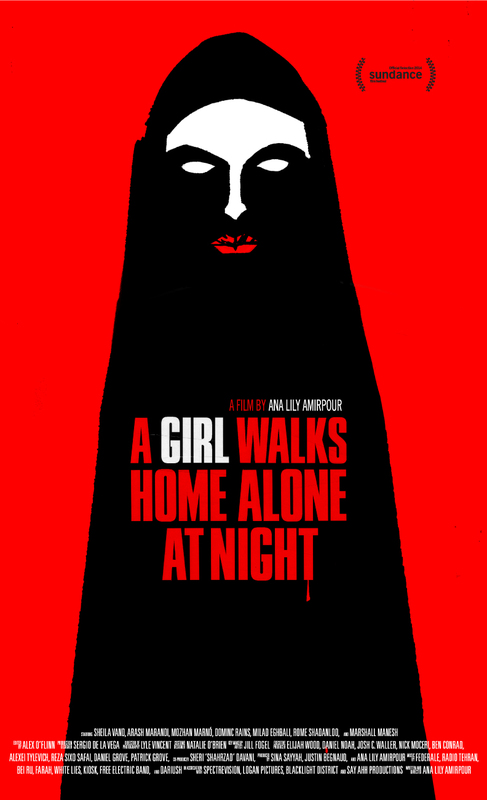 Kino Lorber will release ‘A GIRL WALK HOME ALONE AT NIGHT‘ in New York and Los Angeles on November 21st, with national expansion to follow. This entry was posted in Features, Film Festival, Go To The Movies, in theaters, Iran, Liz, Reviews, What To Watch This Week, Woman Lead, Women in Film and tagged a girl walks home alone at night, Ana Lily Amirpour, Arash Marandi, Dominic Rians, Elijah Wood, genre crossing, horror, Iranian western, liz whittemore, Marshall Manesh, Milad Eghbali, Mozhan Marno, romance, Sheila Vand, soundtrack, thriller, vampire by Liz Whittemore. Bookmark the permalink. News	Pitch Perfect 2 Trailer Debuts! Acca-awesome!